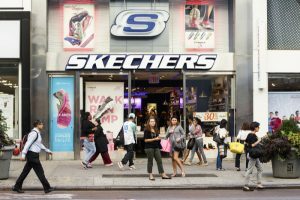 Skechers USA posted its latest earnings for the just ended quarter after the closing bell on Thursday. The footwear and apparel maker posted earnings that were lower than had been expected helping send its shares plunging in afterhours trading. Skechers posted its earnings for its fiscal second quarter of 29 cents a share, missing the consensus estimate on Wall Street of 41 cents, by a whopping 12 cents. For revenue, the company had sales that totaled $1.13 billion that were in line with Wall Street estimates of the same amount. Revenue was higher by 10.6% in comparison to the same quarter one year ago, which was propelled for the most part by the nearly 25% increase in international wholesale business, along with growth of 12.8% in its worldwide retail business. Its same-store sales for stores that were company owned increased 4.5% globally for the quarter, when compared to last year’s second quarter. The figure included an increase in comparable same-store sales of 2.2% for the U.S. and a surge of 11.3% for its international locations. However, the growth of the company was hit extremely hard by a decline of 7% in its wholesale domestic business, as a dip of 6.1% in its distributor business internationally. Skechers posted net earnings of $45.3 million for its fiscal second quarter, while it said its diluted earnings ended the quarter at 29 cents a share. SKX shares were up 1.9% for the day on Thursday during the regular trading session, leading up to the results for quarterly earnings for the company, which instantly sent is shares plunging by over 22.8% following the sound of the closing bell. Revenue was in line with estimates, but did not impress investors enough for them to hold onto their shares as the apparel and footwear maker was hit hard by nervous investors on Wall Street.